Credit “Obsolete, the Book,” http://obsoletethebook.com/post/712686131. When was the last time you looked through a physical yellow pages directory to find the local pizza joint’s number? Probably a long, long time – such local inquiries, whether one is looking for the hardware store’s hours or ordering up some greasy prandial delight, are now the domain of the Internet. Recognizing the potential financial and environmental benefits to killing the phone book, several states have recently passed laws allowing land-based phone line carriers to stop distributing paper directories and only make them available on customer request. Even the National Yellow Pages Association and the Association of Directory Publishers (ADP) seem to have gotten the hint; on February 1, 2011, they setup a website where users can opt out of all paper directories with a single registration (the previous incarnation of the page merely provided links to individual directory publishers). Now that states, publishers, and the public have aligned, it seems that the fate of the lovable yellow doorstop is sealed. Not so fast. In the prevailing spirit, the city of Seattle passed an ordinance last year, imposing licensing and reporting requirements on phone book distributors, as well as assessing annual and per-book fees and requiring them to heed a local opt-out registry. Distributors failing to abide by any part of the ordinance are nailed with a substantial per-violation penalty. Directory publisher Dex Media West did not take long to file a complaint in federal court. Dex Media West, Inc. v. City of Seattle, No. 10-cv-01857, W.D. Wash., complaint filed Nov. 15, 2010. Dex claimed that Seattle violated its First Amendment right to free (commercial) speech by too narrowly targeting yellow page directories for regulation, when other, similar publications (e.g. magazines rife with advertisements, junk mail) were left untouched. It also averred that the ordinance violated the Commerce Clause by excluding locally-published directories from the ordinance. On January 13, 2011, Dex Media moved for summary judgment on these grounds. Dex details several constitutional problems with the ordinance’s construction. 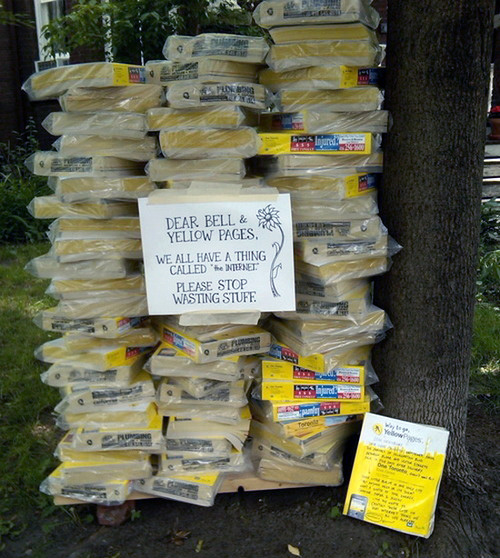 First, as previously noted, the ordinance only targets yellow page directories, rather than unsolicited publications as a whole, and in any case does not rationalize how harms caused by directories are any different from other, similar publications. Second, Seattle bowed to local business demands that local directory publishers be exempt from the ordinance’s requirements, which seems like an almost textbook Commerce Clause violation. Third, and perhaps most practically, the ordinance’s opt-out scheme duplicates an existing, voluntary, and national opt-out scheme, and could encourage other states or cities to do the same, which would paradoxically make it more difficult for a consumer to opt out because of the resulting patchwork of requirements. Note the date the motion was filed – January 13, 2011. The ADP’s improved national opt-out registry was launched on February 1, making the Seattle opt-out scheme even more duplicative than Dex had originally argued. Regardless of the viability of Dex’s constitutional arguments, which seem persuasive, one wonders how the city of Seattle can now argue that the ordinance has any real benefit for the public it purports to protect. In fact, in its January 31 response and cross-motion for summary judgment Seattle is silent on how the ordinance’s regulation and licensing scheme, or its local opt-out mechanism, is any better at relieving the public burden caused by printed yellow page directories than an existing national opt-out scheme. Rather than argue why the ordinance is useful, Seattle expends most of its verbiage on why the ordinance is constitutional. Courts are practical institutions. They, too, will likely inquire why Seattle is insistent on protecting a seemingly purposeless law. This seems to be a case in which a city government, swept along by a tide of public sentiment, attempts to legislate away a problem without adequately considering how best to do so. One might argue that given the printed yellow page directory industry’s inevitable demise (incidentally, supported the industry’s own members, who have moved on to bigger and better things), Seattle should have just left well enough alone. Until the case is resolved, Seattle residents can simply continue to ignore the moldy stacks of banana-yellow phone books strewn about their front stoops when ordering their pepperoni pizzas.